A new biotech company has raised $US25 million to finance research on the effects of psychedelics and other drugs on depression and other mental illnesses. Called Atai Life Sciences, the company owns a large stake in a company called Compass Pathways, which is backed by Peter Thiel. German entrepreneur and investor Christian Angermayer founded Atai. Angermayer also said he planned to invest in research focused on drugs that could help fight ageing and extend life. In June, an under-the-radar startup backed by Silicon Valley tech mogul Peter Thiel made enough psilocybin – the active ingredient in magic mushrooms – to send 20,000 people on a trip. It was part of a larger effort by the company, called Compass Pathways, to study how psychedelic drugs could be used to treat depression. On Wednesday, German entrepreneur and Compass investor Christian Angermayer launched a new startup: a biotech company focused on financing more of the kind of research that Compass is doing. Called Atai Life Sciences, the company has already raised $US25 million from investors like ex-hedge fund manager Mike Novogratz and Icelandic entrepreneur Thor Bjorgolfsson. Atai also owns roughly 25% of Compass, which Thiel has funded. Atai’s goal is to help fund more studies that explore the therapeutic potential of psychedelic drugs like psilocybin and others on mental illnesses such as depression. In the past, non-profit efforts at doing this kind of research have run into many obstacles, from a lack of funding to a difficulty enrolling enough patients for their trials. Angermayer hopes Atai can help address those issues, telling Business Insider he believes Atai will help unleash a “virgin market” for the research. Alex Tew and Michael Action Smith, founders of the popular meditation app Calm, also invested in Atai. Former National Institutes of Health director Tom Insel, who previously served as an advisor to Compass, will stay in that role. Compass also raised an additional $US33 million as part of the latest funding round, bringing its total to more than $US38 million. Compass is already the world’s leading producer of psilocybin for research, Angermayer told Business Insider. Earlier this summer, the company received regulatory approval to begin one of the first large studies looking at the effect of psilocybin on treatment-resistant depression, a severe form of the illness that does not respond to other medications. Compass also filed for a patent on a form of the drug that it makes in a lab. In addition to its work on drugs for mental health, Atai will also fund studies of treatments designed to fight ageing and extend life, Angermayer said. To do so, the company is partnering with German-based Innoplexus, which uses AI to develop drugs. 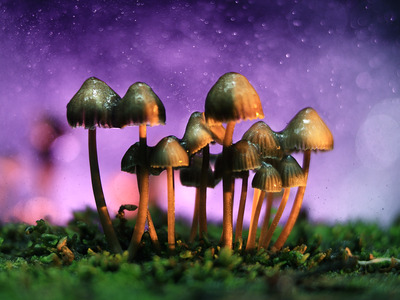 Psilocybin has become a promising candidate for anxiety and depression treatment because it appears to disrupt the sorts of engrained brain activity patterns that are the hallmark of those diseases. One recent study looked at the compound’s potential to help alleviate anxiety in cancer patients; others have looked at psilocybin’s potential effect on depression, PTSD, and alcoholism. Compass Pathway’s study, which got FDA approval in August, looks at the effect of three different doses of psilocybin (1 mg, 10 mg, and 25 mg) on treatment-resistant depression. A “standard” dose of dry magic mushrooms is roughly 2 grams, or about 20 mg pure psilocybin, according to nonprofit educational organisation Erowid. The clinical trial involves 216 people enrolled across several research sites in Europe and North America. The magic mushroom isn’t the only psychedelic drug getting renewed attention. There’s been a steady trickle of scientific research on psychedelic drugs’ potential therapeutic benefits for at least the last five years. Not everyone is thrilled about the idea of a for-profit company leading the research on psychedelics. So far, the bulk of work in the field has been pioneered by research institutions and nonprofits. Now, that could change. “Is this going to be the Eli Lilly of psychedelics? No one ever imagined that,” Charles Grob, a professor of psychiatry at the University of California, Los Angeles and an author on one of the first studies of psilocybin in cancer patients, told Business Insider. Grob is also affiliated with the nonprofit research institute LA Biomed. “Capitalism comes to psychedelics? I don’t know what kind of fit that will be,” Grob said. Still, many previous research efforts on psychedelics – from LSD to psilocybin – have run into barriers like running out of funds. Angermayer believes Atai will help prevent that from happening. He estimated that by the time the clinical trial results from Compass come out in the fall of 2019, it won’t be more than two years until psilocybin becomes the first medically-approved psychedelic for depression. “After that, there will be no doubt” that the drug works to treat depression, he said.